Congo Democratic Republic – No new banknotes. According to an article published by Media Congo in 14 November 2018, up to that time the new banknotes announced for release in August 2018 (CDF1,000.2 and CDF2,000.2) were not issued up to that date, and the Central Bank is providing no information about the failure to release them, as previously announced. 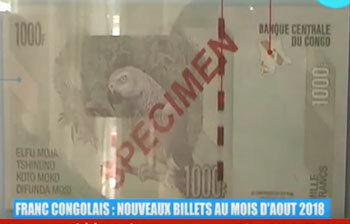 These new banknotes were to be issued to fight what is thought to be massive counterfeiting of the current ones.